Snapchat recently announced several changes to its app, and now it has introduced a new feature called Snap Games. The feature works as kind of an instant game and will allow users to play different AR-powered games while chatting with their friends. The new feature was announced at the Snap Partner Summit today. Snapchat started as an app that allows you to send visual messages to your friends and share your surroundings through the camera. Snapchat Filters and stories are what brought success to the app. Now, the company is encouraging people to play games with their friends on their smartphones. Instant games are becoming a more and more prominent feature when it comes to social media networking. Not only Facebook and Messenger allow you to play games while chatting with friends but many other apps as well. Snap Games is the company’s latest attempt to compete with Facebook’s gaming feature as well as Apple’s iMessage games. Mobile games developers are earning their income through advertising on Facebook and other platforms, and given that the gaming industry is growing, Snapchat decided to seize this opportunity. Snap Games can be easily launched through the Snap Chat bar. 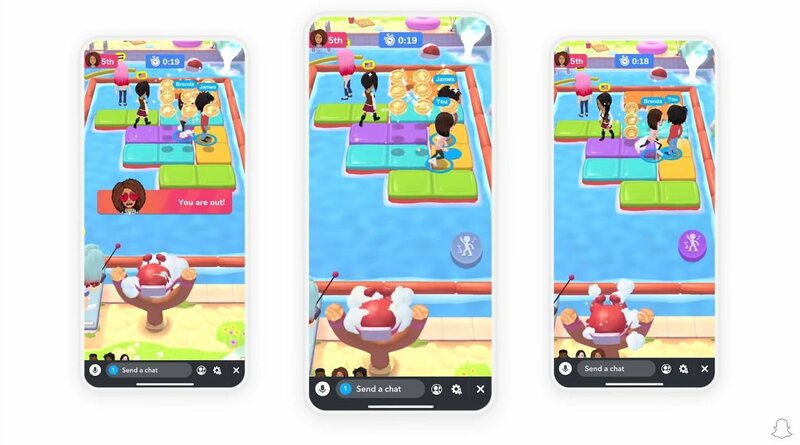 The games don’t require any additional installs, thus it’s called “instant gaming.” Users can play with their friends while chatting at the same time, while the feature allows people to see who else from their friend list is gaming. Users can also talk live through the voice chat while gaming. Right now, there are six titles that are available on Snap Games. A.T.S. Drift Race from ZeptoLab lets you drift around the track and speed past friends for the win. The new feature will be coming as a series of rollouts to people worldwide on their Snapchat accounts to play the new games. Earlier this week Snapchat announced other new changes to its app and added more features. One new feature encourages more use of Emoji and allows people to use their location to check-in at a location and add a corresponding emoji to represent their activity. That way, your friends can learn about your activities and also join you if they want.